Charles Barkley went on the "Mike Missanelli Show" in Philadelphia last week and talked about his philosophy on life. He revealed some interesting things about himself, like he never lets anyone buy him a drink because no one bought him drinks when he was poor, and he always talks to random strangers who come up to him because most of them are really good people. The best part was when he talked about how great his own life is, and how there are only five real jobs in the world — teacher, policeman, fireman, doctor, soldier. It was a monologue delivered with self-awareness, in his signature style. I've lived 51 years. I've lost two brothers. One died at birth and one died four or five years ago. We got great lives. Why would we be miserable? I'll tell you, there's five real jobs in the world: teacher, fireman, policeman, doctor, and someone who's in the armed services. Those are five real jobs. I dribbled a basketball my entire life, and now I get paid to watch LeBron James and Kevin Durant play. You get paid to come in here and talk sports. You get to watch sports and come on the radio and talk about it. Man, we're winning. We're so blessed. You see stuff all that time that's, like, man, I'm so blessed. Smith's commentary occurred during a discussion on ESPN2's ''First Take'' last Friday about the NFL's two-game suspension of Baltimore Ravensrunning back Ray Rice following charges he assaulted his now-wife. The remarks attracted widespread attention, including a stinging rebuke online from a fellow ESPN personality. Nairobi, Kenya: The rivalry between Machakos Governor Alfred Mutua and Senator Johnstone muthama played out in public after the latter snubbed the county boss at a Wiper party meeting held in Nairobi. During the Parliamentary Group meeting held at the party headquarters in Lavington yesterday, Muthama is reported to have refused to shake Dr Mutua’s hand at the end of the meeting. It was not clear if party leader Kalonzo Musyoka who was present witnessed the incident. Muthama thereafter addressed journalists and termed the governor a rebel, contradicting an earlier statement by Wiper Chairman David Musila on the existence of alleged party rebels within the party ranks. “The issue of party rebels is just a rumour and such matters are discussed in National Executive Council meetings and not PG’s,” Musila had said earlier in the meeting. 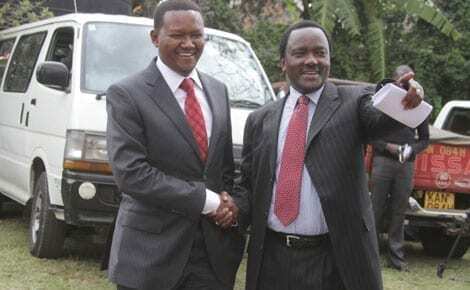 Despite being Mutua’s biggest critic, Muthama insisted that he and the governor were not enemies. “My job is an oversight one and that is what I have been doing. If I for example see that money is not being used properly, then I will speak out,” he said. The Wiper party has announced that it is still committed to the proposed referendum that CORD is pushing for. The members added they would support CORD’s decision to replace National Assembly’s Minority Whip and Kilifi North MP Gideon Mung’aro with Wundanyi MP, Thomas Mwadeghu. The meeting was attended by 15 MPs. Speaking on behalf of the party after the meeting, Borabu MP Ben Momanyi insisted that the meeting’s agenda did not include discussions on party rebels or disciplinary action against governor Mutua, who has supposedly opposed the call for a referendum. Other matters that were discussed at the meeting included the party’s annual delegates conference, which Momanyi said was still on course, adding that the dates would be announced at a later date. Busia County: Men converged at Nambale Sub-County headquarters to be given wives during the weekend after getting word from unclear sources that the government was bringing free ladies from Ukambani. Although President Uhuru Kenyatta signed into law marriage Bill that allows men to marry more than one wife in April 2014, it seems many men are having problems of getting the best women from their midst to marry. Men from as far as Bungoma and Siaya started arriving at the venue (Nambale shopping centre) as early as 6am determined to wait as long as they get wives. They alleged that they were told by government agents that they come for free women, 10000 shillings and one sack of maize to start their new life with, but some men insisted that they were informed in villages by provincial administration of the event. “There are people from the DCC’s (Deputy County Commissioner) office who were moving around our villages telling us who don’t have wives to come here today with ID cards and be given wives, one sack of maize and Sh. 10000 to start life with. Some even told us that they we will be given sufurias and cooking stick,” said one of the men. However women and girls from around could not take it easily as they kept vigilant on their men, keen to prevent their husbands and boyfriends from getting the said Kamba ladies. Nambale sub-county DCC Francis Lenyangume denied being aware of such an event organized by government. And after waiting for the whole day without the said women coming, the desperate men went home in the evening more desperate but with a hope that one day they will meet the most talked of Kamba ladies. Bottled water in Mombasa ....sumu! Post by Joseck Matheri Chege. I know that two multiplied by three equals six, but I genuinely have no idea what this tweet means. Maybe it’s a code that is only given to people that can get rim on a 10-foot hoop. Apparently it’s cool to wear Michael Jordan’s number now because, well, two times three equals six. Hey this is Eric Omondi. I am a comedian and a second born in a family of 4. I went to Lake Primary and latter joined Kisumu Boys High School. I am also a graduate of Daystar University, a degree in Mass Communication. What most people don't know is that my life has literally for the longest time relied on God and nothing else. I am a strong believer in the doings of God....I still vividly remember one evening while in form three, I asked God to lift my head and ever since He has been my Rock and Foundation. May you find Peace and Love in Him who is the Most High.